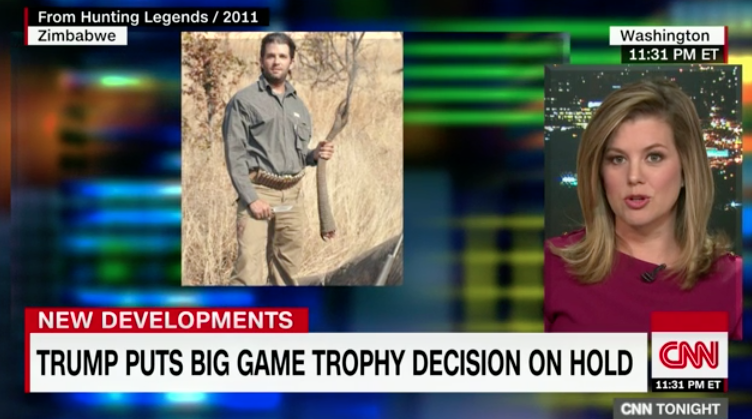 Washington (CNN)– President Donald Trump’s move late Friday night to postpone a decision to allow the import of elephant hunting trophies from two African countries came as a surprise not only to interest groups, but also the US Fish and Wildlife Service employees who oversaw the proposed change in policy, a source with knowledge of the agency’s process told CNN. Agency employees responsible for recommending the change found out that it had been placed under review at the same time the public did: when the President tweeted out his decision, the source said. Trump tweeted that he was putting the “big game trophy decision on hold until such time as I review all conservation facts,” adding that the issue had been under study for years. The Fish and Wildlife Service had reviewed the restrictions on the import of elephant trophies from Zimbabwe and Zambia for more than a year, as required by the Endangered Species Act, the source with knowledge of the agency’s process said. The review process included visits to non-governmental organizations, the consideration of elephant population counts and the country’s poaching management, the source said. The source called Trump’s decision to halt the policy change an “uncharted situation,” saying it was the first time a president had intervened in an agency finding under the Endangered Species Act. The President’s statement Friday came just hours after White House press secretary Sarah Huckabee Sanders defended the Fish and Wildlife Service move, telling reporters that “career officials” were responsible for the proposed policy change. Interior Secretary Ryan Zinke tweeted a statement Friday evening after Trump’s tweet. The White House and Department of Interior did not respond to CNN’s requests for comment about the reason for the reversal and what a further review by the administration would entail. The Fish and Wildlife Service referred CNN to Zinke’s statement. The Fish and Wildlife Service’s decision to allow elephant trophy imports from Zimbabwe and Zambia was published in the Federal Register Friday. Wayne Pacelle, CEO of the Humane Society, a national animal protection group, viewed Trump’s tweet as a tentative victory. On Saturday morning, Trump retweeted the Twitter posts of former Fox News anchor Greta Van Susteren and British journalist Piers Morgan, who thanked him for his move. Sportsman’s groups, however, said they view Trump’s pause as only temporary. Others said they see the President’s decision as a stall tactic in the face of bad optics, in that the Fish and Wildlife Service finding came down within hours of a political coup in Zimbabwe. Trump’s move doesn’t mean the administration is backing off its push to expand hunting rights nationally and internationally, sources said. According to one source involved in the hunting conservation community who spoke to the President’s son, Donald Trump Jr., during the 2016 campaign, members of the Trump family wanted to change Fish and Wildlife Service regulations on big-game hunting. Donald Trump Jr. and his younger brother, Eric, are both big-game hunters. Photos posted in 2012 by the website Gothamist show Donald Jr. holding an elephant tail. The website says the photos were from a 2011 hunt in Zimbabwe. Donald Jr. is also an active member of the Boone and Crocket Club, and helped with the search for Interior secretary. As a Republican representative from Montana, Zinke himself was a member of the Congressional Sportsmen’s Caucus, and he has made no secret of his desire to expand hunting on US public lands.